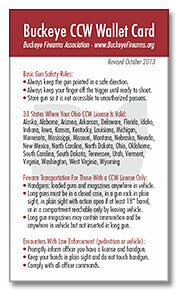 Firearm Instructors: Buckeye CCW Wallet Cards add value to your class and protect your reputation by keeping graduates informed and responsible. Sheriffs: These cards help educate citizens so they can comply with current Ohio law and interact with law enforcement in a professional manner. Citizens: Carry a card in your wallet and give extra cards to family and friends to help stay legal as you carry around the State of Ohio. The True Source Of Random & Mass Shootings And Violence? Concealed Carry Law Enforcement Notification: Is it a duty, or a courtesy?